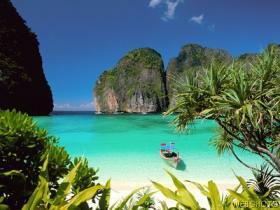 Blog from Ko Phi Phi, Thailand | Gemma goes global! this picture is exactly how it is here, absolutley stunning. Beautiful warm sea's, snorkelling with amazing tropical fish, experiencing the thai massage, sipping cocktails on the beach are just some of the stressful things ive been up to. Im currently on an island called Ko Phi Phi off the coast of Phuket, which was a bit smelly and manic for my ideal image of Thailand! So caught a boat to Phi Phi and have been here relaxing for a few days. I went snorkelling around the island of Ko Phi Lae yesterday, and it was amazing, the sea is so warm and clear, saw the most beautiful fish ever, though i imagine they did not look at me the same way as i did them, hovering over them with a pair of bright yellow goggles and a strange tube coming out of my mouth! Tomorrow we catch the boat to Ao Nang, a beach off the coast of Krabi, before flying off to Vietnam, which im really looking forward to. So till then. . . . . .